If you've been reading for any length of time, you know that I have a . . . uh . . . "thing" for Christmas. As in, I like it. A lot. I especially like the decorating and stringing lights and giving presents and decorating and did I mention that I really like the decorating? Well, I do. A lot. This year I wanted to spread a little Christmas cheer to some kids in need. Things didn't exactly go as I had hoped, but enough people said, "We can dooooo this," that I figured I better not let it drop. The mission: To raise $1000 and hook up a whole lot of kids with some really fantastic toys for Christmas. The deadline: November 15th. After that, I'll be taking every penny that winds up in the PayPal account, doing a little shopping, and delivering as many toys as possible to Toys for Tots (via Stuff-a-Bus) and the kids at a local domestic violence shelter (specifically HOPE Center). There are two ways you can help. Donate: There's a handy-dandy Give Christmas Crazy button over in the far right column. Click that and it'll take you to a PayPal page where you can make a monetary donation. Advertise: Revenue from all advertising sold on this site between now and November 15th will be added to the Christmas Crazy for Kids monies. Email me at burghbaby (at) gmail.com to reserve your space. Image Links--$50 per month: Your image linked to a site of your choosing over in the far right column. 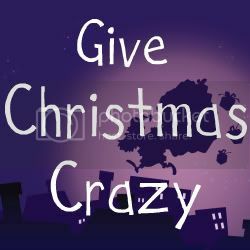 It will be the same size as the Give Christmas Crazy image (150 x 150). Images will be placed in the order in which they are received. Text Links--$20 per month: Your text linked to the site of your choosing over in the far right column. Text links will be placed at the bottom of the column. Let's spread some Christmas Crazy! That is a really great idea! Done! I hope this turns out to be a huge success, what a great idea! Done! Sorry it couldn't be more. This is a great thing you're doing. Thanks! What a great idea! I'm crazy in love with Christmas too, and even posted about festive stuff today on my blog. I'll donate to your cause for sure soon! :) Nothing greater than giving to children at this time of year! i'm fighting with coworkers over whether or not they are permitted to listen to christmas music this early (i say oh hell no, not until the day after thanksgiving), and here you go all making me wanna be all giving on this fine monday. I donated. Not a ton but hopefully it helps! You are amazing for doing this!!! ps. come on over to my blog and enter some contests; you could donate the winnings to your Crazy Christmas!! hey can i put that christmas crazy on my blog in the hopes of a buck or two? unemployment = do mas from me, but i'm glad to help!!! let me know!! Gladly donated! keep up the good work! What a great idea. I love when those that have - even if it's not much give. Give their time, love, and even money. It's what keeps the world going. I LOVE Christmas - not just Christmas but winter. I love snow, cozy blankets, and all that it entails. Have you talked to Toys R Us? I heard they will make awesome arrangements for stuff like this. Will other blogs promote this? I'll bet IHeartPGH and some other people would put this up.